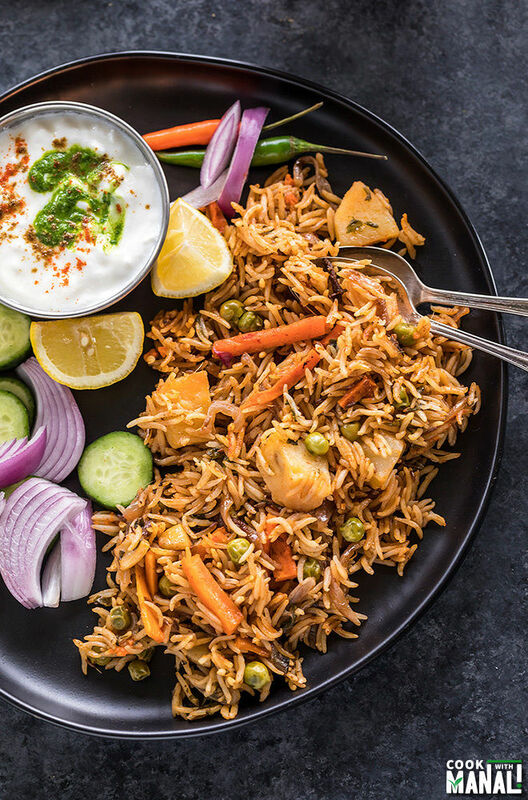 Easy Instant Pot Vegetable Biryani – fragrant basmati rice cooked with whole spices, herbs and vegetables. This easy biryani is packed with so much flavor, is also vegan and gluten-free. While it tastes great on its own, I enjoy it with a side of raita (yogurt dip). I always find it very hard to get back to a routine after a break. Since I spent most of March in bed, now I am finding it difficult to get back to my daily routine. Everything feels like a task, even cooking! Isn’t it strange how habits change so quickly. I know I will get back to it pretty soon and I am trying my best but it hasn’t been easy. I haven’t gone to the gym in ages and to go back? Well that will take some extra motivation on my part! On top of it Sarvesh keeps telling me to take it easy. He’s right though, I get so tired these days so I really shouldn’t push myself. Anyway amidst all these challenges of getting back to life, I took out my Instant Pot after a while and made this vegetable biryani! I have become so used to my IP, that now I can hardly think to cook in anything else. This happened because of my cookbook! For 4 to 5 months, I used my Instant Pot 24 x 7 testing recipes. In fact I have three instant pots, not that we need three when are only 2 in the house! But because I had to test so many recipes for the book in a little time frame, I just couldn’t do with one IP. I was testing 2 to 3 recipes simultaneously and I needed extra IPs for that so Sarvesh got me 2 more. Now I am done with those crazy days of recipe testing for the book but I have become to used to the Instant Pot that unknowingly I always take it out when I think of making dinner. I think my hands just reach out to it on its own! So yesterday I took it out and made this vegetable biryani. 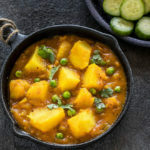 I am always excited to share Instant Pot recipe with you guys especially when it turns out this good. 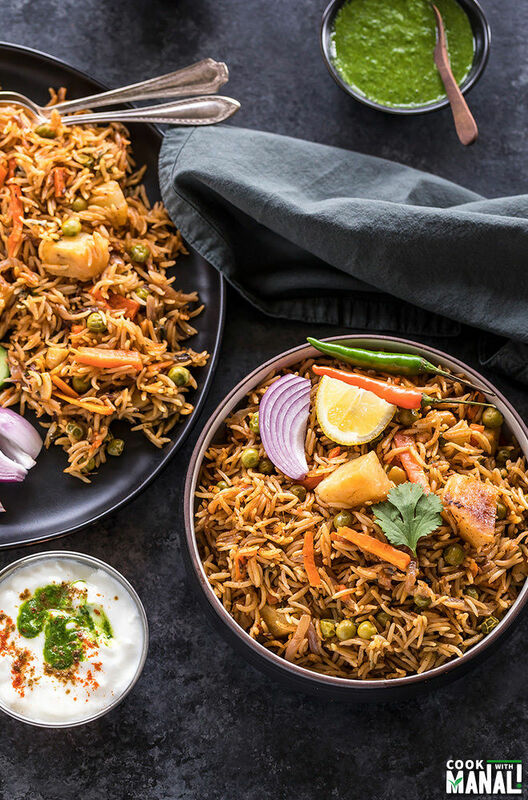 You guys, this is just the easiest vegetable biryani ever! I call it the lazy cook method for making biryani! Traditionally biryani making is a long process. You cook the rice and the veggies and then layer them and then cook them over low heat. This is like a super easy recipe to make biryani without compromising on taste. 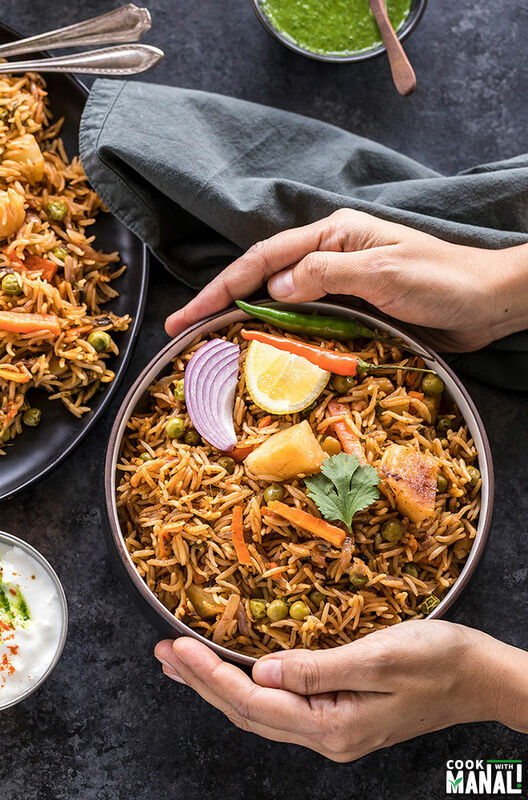 It’s just one pot, few minutes of prep work and you will have delicious biryani ready in no time! By the way, I have a vegetable biryani recipe in my book too but that involves more ingredients (and also tastes amazing!) but I just thought it would be nice to share an easy version of the same with you guys on the blog! 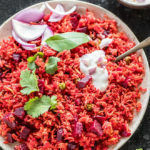 What all is in this Easy Instant Pot Vegetable Biryani? & of course basmati rice! If you ask me, a good biryani depends a lot on the type of rice you use. You of course have to use basmati rice for a good biryani, however try to get the one with extra long grains. I use this basmati rice called the XXL Sela Basmati Rice and it has really long grains. The resulting pulao/biryani is always so good when I use this rice! I highly recommend it! This is vegan/vegetable biryani so you may use any vegetable of your choice. I have used potato, carrots and green peas here. I just won’t recommend using cauliflower here because it will turn out super mushy or if you want to use it, make sure to cut it into large pieces and then use in the recipe. 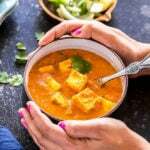 You may also add paneer or tofu to this recipe. 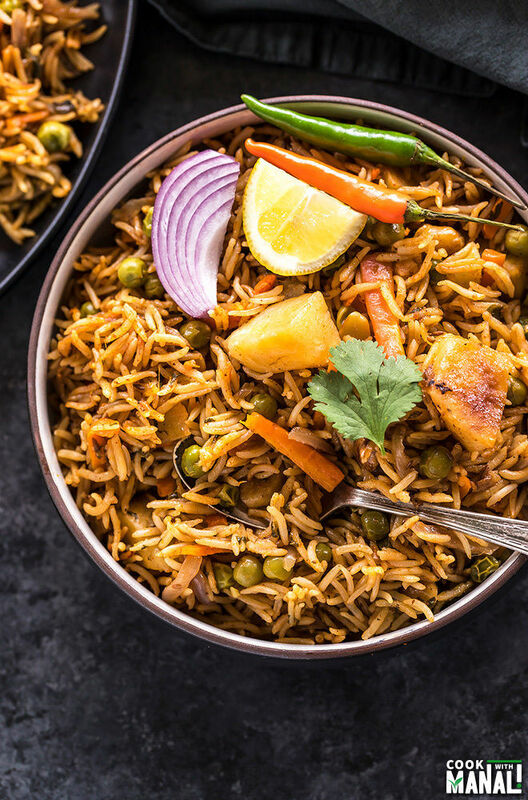 This fragrant instant pot vegetable biryani is packed with so much flavor especially with the addition of all the spices and fresh cilantro. 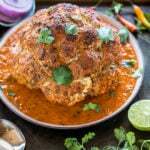 I went easy on the ground spices and used only a bit of garam masala and smoked paprika in this recipe. You may add more spices if you like, for example ground cumin or ground coriander. I thought these two spices were just perfect because the biryani gets so much flavor from the whole spices that you don’t need a ton of ground spices. As you guys know, I can’t handle much heat so I have only used 1 green chili here. You may use more green chilies or may even add cayenne/red chili powder if you like spicy food. 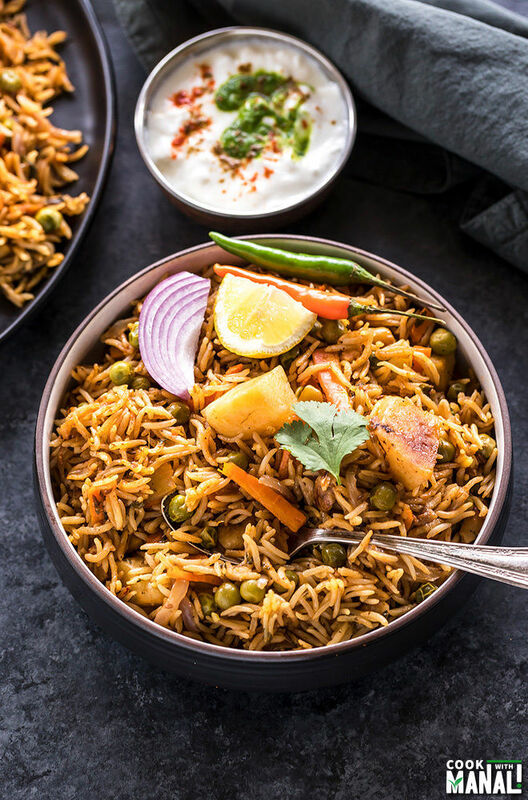 This instant pot vegetable biryani is a one pot meal which is sure to enjoyed by your entire family. It’s also vegan & gluten-free! If you are looking for an easy dinner to make this weekend, I suggest you give this recipe a try. I promise you won’t be disappointed. It is best enjoyed with a side of raita and chutney. Wash and rinse the basmati rice until water turns clear. Then soak it in 2 cups of water for 20 minutes. While the rice is soaking, chop all the veggies. Also soak the frozen green peas in warm water for 5-10 minutes. Once 20 minutes are up, drain the water from the rice and set it aside. Also drain the water from the green peas and set it aside. Press the saute button on the Instant Pot. Once it displays hot, add oil to the pot. To the hot oil, add bay leaf, green cardamom, whole cloves, black peppercorns and cumin seeds. Saute for 30 seconds until the spices are fragrant. Then add the sliced onions, along with the green chili and cashews. Cook for 3-4 minutes until onion turn light brown. The cashews will also turn little brown by now. Add ginger-garlic paste and cook for 1 more minute. Then add the vegetables – potatoes, carrots, green peas. Also add the chopped cilantro, garam masala, smoked paprika and salt. Add the drained rice to the pot and gently toss it all together with a spoon. Add water to the pot. Do not stir anything at this point. Close the pot with its lid and then press the manual or pressure cook button. Cook on high pressure for 5 minutes with the pressure valve in the sealing position. Let the pressure release naturally for 5 minutes and then release the remaining pressure manually. Open the pot and fluff the rice with a fork. 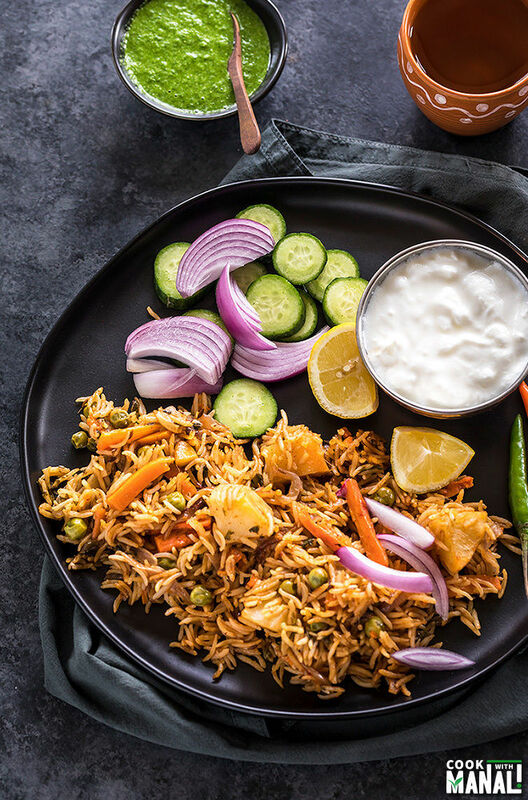 Serve this instant pot vegetable biryani with a side of raita like this mango mint raita or spinach raita! Easy Vegetable Biryani made in the Instant Pot! Basmati rice cooked with spices and vegetable makes this biryani one of my favorite one pot meals. Packed with so much flavor, this biryani is also gluten-free! Then add the sliced onions, along with green chili and cashews. Cook for 3-4 minutes until the onion turns light brown. The cashews will also turn little brown by now. Then add the vegetables - potatoes, carrots, green peas. Also add the chopped cilantro, garam masala, smoked paprika and salt. Serve the biryani with a side of raita! Adjust spice levels to taste. Add cayenne pepper/red chili powder to make the biryani spicier. You may add fresh mint leaves to the biryani too in addition to cilantro. 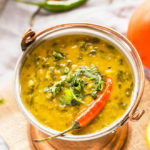 You may use ghee in place of oil if not making it vegan. So fluffy! The rice is perfectly flavourd and prepared, Manali. Hi it looks yummy. If i want to make biriyani for 3 cup of rice , i will triple ingredients, but for how much time i have to do pressure? hmm I have never tried it but I would maybe do 7 minutes at high pressure and then 5 minutes natural pressure release followed by quick release. Time shouldn’t change much! hope this helps! I just tripled and left the original cook time alone. Turned out perfectly. SO delicious. A hit for my entire family, including 3 littles. Thank you! 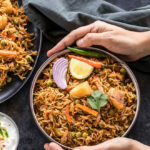 I never thought that I could see instant pot biryani recipe. It looks so delicious…. in india, instant pot is quite new and yet to come in the market.. I am eagerly waiting for this holy grail product 😉 .. Thank you Priya! I love my IP so just keep using it all the time! Thank you for sharing I will have to try it. I hope you’re feeling better! Thank you Cindy, I am much better now 🙂 and hope you enjoy the recipe! I was wondering if I could omit the onions? Mom doesn’t eat onion or garlic and was wondering if you had any substitution ideas? Hi Priya, does your mom eat green onions? You can replace regular onions with those. And if she doesn’t eat that either,simply add more of other veggies like french beans or paneer. Skip the garlic and use ginger paste only. Hope this helps! Looks great! When do you use the black peppercorns? Didn’t see that. Do you just grind them and garnish with pepper after the dish is finished? Or do you add the whole peppercorns at some point in steps 2 -5? yes step 2 along with all other whole spices! with the whole spices, sorry fixed it in the instructions now. Hi there, if i don’t have a pressure cooker… can i still do this in the oven? if so, how long do you think i should cook for? You can do it to on the stove-top, in a pan. Just cook until the rice is done. 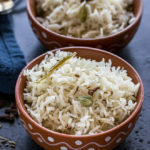 Would the cooking time change for brown basmati rice? Thank you for your wonderful recipes! Yes Lavanya, it would! Brown rice takes much longer to cook. This recipe will not work with brown rice because it usually takes 20 minutes + to cook and these veggies would turn very mushy by then…I will try and post a brown basmati rice biryani! My instant pot overheated before it could get to pressure. Did that happen to anyone else? hmm that shouldn’t happen Vicki, did you get the burn message? and do you have a 8qt newer model? Hi, Your rice looks fluffy. What brand of basmati rice do you use? Hi Roopa, I have mentioned the link in the post. Please look at the post! Can you replace the rice with brown rice? And how long do you think I will have to cook it for in the Instant pot? Hi Ritu! 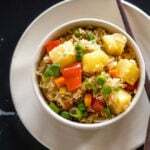 I have never tried this recipe with brown rice but I know that brown rice takes around 22-24 minutes to cook in the IP [check here: https://www.cookwithmanali.com/instant-pot-brown-rice/%5D. I would not add potato then, it will turn to mush in that long time! Rather add paneer of tofu..hope this helps! Hi Keerthi,I have not tried the delay start mode, but I am not sure if you could do it for the biryani though…it may be a good option for dump and go recipes! Hi Manali! This biryani surely looks yum. Before I try, I had a small query. I have the traditional Hawkins pressure cooker and not the instant pot. How Long do you think it will take if I had to cook in the traditional cooker, 5 mins would be too Long, right ? Please advise. Hi Kirti, if using the regular pressure cooker, I would say follow all the steps as it (of sauteing and all) and then pressure cook for 2-3 whistles on medium-high heat. Hope that helps! Hi Manali! LOVE your recipes!!! I’ve printed out 4 of them today and if I get enough time will make all of them! I’m trying to get acquainted with quinoa and will try your Quinoa Mango Thai Salad and IP Mexican Quinoa. I’ve already made twice your Thai Peanut Noodles and they have made it into my regular rotation of things I make for supper at work! Thanks a lot for these and I do enjoy Indian food ever since watching an older Britcom Red Dwarf which introduced me to Vindaloo! Take care an my very best to you and yours!!!! Looking forward to making this in my new IP. Quick question…can I add tofu/paneer along with the other veggies or should I sauté them separately and add then after the biryani is done? Hi! 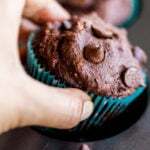 This is a fantastic recipe, and thank you for sharing it! I was wondering… would a black cardamom pod or two be a good addition in place of the smoked paprika? If so, should I cut back on the green cardamom? Thanks again for such a quick, straightforward, and tasty dish! Sure you can add black cardamom. And no don’t cut back on green cardamom, black and green are entirely different in flavors!